Have you ever wanted to be a cowgirl? I was born and raised a city kid with an overwhelming, overpowering love of horses. My folks, both confirmed city people, are still trying to figure out how horse-mania manifested itself in one of their children. I think it came from my maternal grandfather. He was a sheriff in North Dakota in the early part of the twentieth century and a lifelong horse trader. The Equine gene seems to have jumped over a generation and landed full force on me. When I was fourteen, after years of begging for a horse of my own, they gave in and bought me a two-year-old buckskin gelding named Gypsy. From riding Gypsy for fun, I moved on to barrel racing and rodeo. I've had so many great barrel horses, and have been so fortunate to be able to do what I love. This is a picture of my latest barrel horse, Star Dun Mack, better known as Cisco. 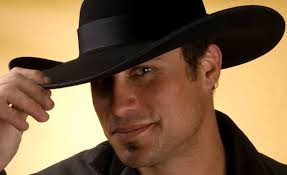 I found my second love, writing contemporary western romance, much later in life. I remember reading a book that was a great romance, but the author had the horse, rodeo and ranching parts all wrong. Like the newbie I was, I though, I can write a better book than that. How hard can it be? Let me tell you, it's hard. Very hard. I have several books under my belt now and my latest, Sugar Pine Cowboy, is the fourth in the Sugar Coated Cowboys series. This book is Marlene's story. If you've read Gimme Some Sugar, you'll remember Marlene, Micah West's ex-wife. She was a memorable character, and not in a good way. Sugar Pine Cowboy is one of my favorite books, because of the fun I had watching Marlene come into her own. Then there's Bose Kovac, the original Sugar Pine Cowboy, and one of the sweetest heros I've had the pleasure of writing. 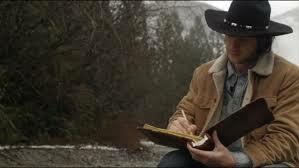 Sugar Pine Cowboy is now available in the anthology Cowboy Charmed. Along with mine, there are five other contemporary western romances written by award winning authors for only 99 cents. I hope you enjoy them all. I've been honored to be a guest contributor on Cowboy Kisses. For me, it has been a dream come true to share information and stories with you, the reader. As this year draws to a close, I want to wish each and every one of you the merriest of holidays and a prosperous new year. I am working on my second pony express story, Always, Stone. It was scheduled to be released just before Christmas unfortunately life did get in the way. So I am working on it now hoping to have it out in a few short weeks. Writing about the Pony Express has been exciting. I love the historical backdrop and their daring feats. Little was really written about these brave young men, but what we can find is used to create fiction. I hope the reader will enjoy these last few tales my writing partner Reine Torres and I will bring you. I am also writing some short contemporary stories under my pen name, Tessa Berkley. These stories are set in a fictional town of Cactus Gulch. So far we've had a baby left on a doorstep and in January, a young woman returns home to find her place at her father's side. She hopes she can keep the man of her dreams from finding out the child she has is his. Left once, she doesn't want to break her heart again. I have been truly blessed this year to have you the reader at my side. I can't thank the owners of Cowboy Kisses enough for their encouragement and help as I make this journey through publication. So from my house to yours, a very merry New Year. Welcome 2018 may you bring only joy and happiness to all. Painting by the wonderful cowboy artist, Charlie Russell. 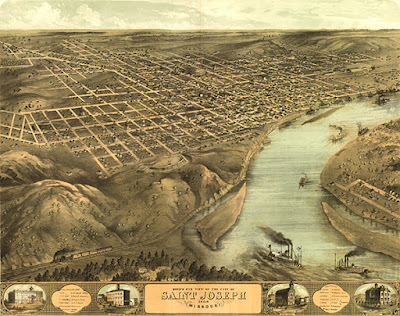 Known to many as St. Joe, the town of St. Joseph along the Missouri River got its start in 1826 when Joseph Robidoux, known to the locals as “Uncle Joe,” a local fur trader, started his Blacksnake Hills Trading Post catering to the local tribes. Before long, he developed a trading empire that stretched as far west as the Rocky Mountains. The first post office in the area was housed in Robidoux’s trading post in 1840. 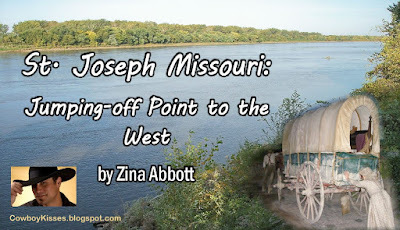 When the Platte Purchase made his land part of the state of Missouri in 1837, the trading post developed into a settlement that was incorporated as St. Joseph, named after Joseph Robidoux’s patron saint, on November 20,1843. 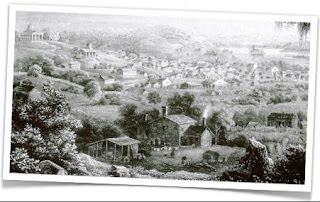 St. Joseph stayed relatively small until the gold discovery in California, but grew rapidly with westward migration. 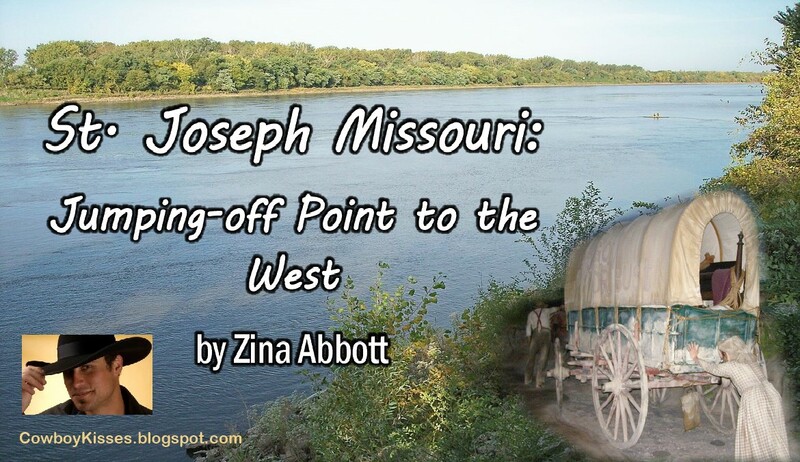 Along with Independence, Missouri, the city quickly became the last supply and “jumping-off point” before the many pioneers headed towards California on the Oregon Trail that had been traveled for the first time by wagon train in 1843. "This place contains some two thousand five hundred inhabitants and at present is a very busy place on account of the California emigrations which seems to center here; hills and dales are white with their camps. Many have crossed the river and encamped on the west side in the Indian Territory. Place contains four good sized Hotels, about twenty Stores and the residue is made up of groceries, bakeries, etc." You will be hearing more about St. Joseph, Missouri from me in the next few months. 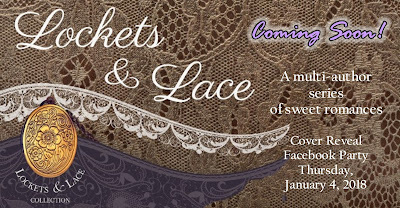 I am publishing two books--a prequel and a full novel--in a multi-author series, Lockets & Lace. 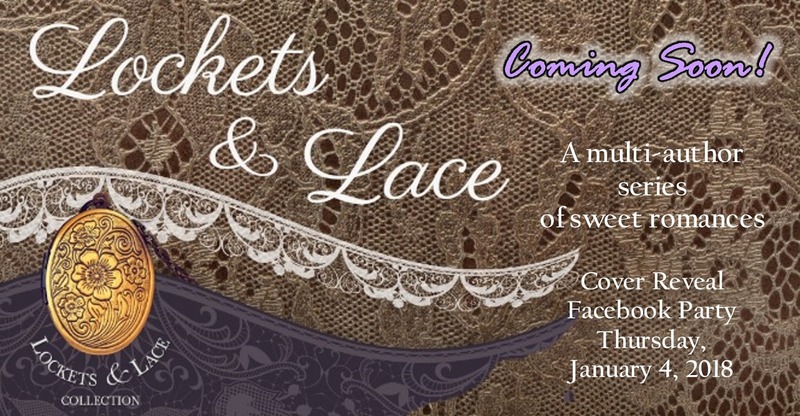 To stay informed about our upcoming cover reveal events, publication of the prequel, publication dates of the novels, and opportunities to win gifts and prizes, please CLICK HERE and "Like" and "Follow" the Lockets & Lace Facebook page. We are already inviting readers to our first Facebook event to be held January 4th. Please CLICK HERE to let us know you will be attending. Be among the first to see the beautiful new covers in this series. Something Christmasy,Something Western. . .
We all know that everything in Texas is big, and down there in Bryan,TX, Bill Horton had one big idea. As General Manager of The Traditions Club, a private country club and home to Texas A & M’s golf teams, he is a self-professed foodie, spending quite a bit of time watching The Food Network. 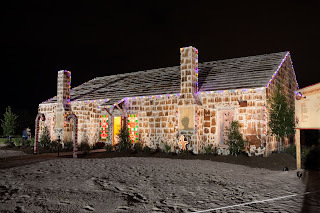 Having it in mind that an acquaintance, also in the country club business, held the Guinness Record for having built the largest Gingerbread House in the world up in MN., this Texan was not about to be outdone. So when the execs of the local St. Joseph Hospital discussed with him ways to raise money for their new Trauma Center, Horton had just the plan . . .
A plan that took $10K to bring Guinness on board, as well as an architect and a builder, in order to officially break the record. Luckily for Bill, the membership of the country club is many and varied, and the hospital’s own fundraisers came up with sponsorship levels of up to $25K (donated by Thrive Home Healthcare). Drawings for the house and recipes for the gingerbread were then submitted to Guinness, and the idea was off and running. So, what did it take to build this gingerbread house? With ingredients and structural materials donated by vendors the club uses—everything from candy to lumber—it took 1,800lbs of butter, 2,925 lbs brown sugar, 7,200 eggs, 225 gallons molasses, 7,200 lbs flour, 1,080 oz. ginger, 720 oz. cinnamon and so on—you get the idea! It also took over 200 people in various capacities from ticket sales and parking lot attendants to electricians and builders. Due to the fact Santa was going to be present for two weeks and the house would be open to the public, the building needed a foundation and a building permit. One thing they hadn’t counted on, however, was. . . bees. Unexpected high temperatures for Texas in December brought the bees back out, covering the house in millions. Beekeepers had to be called out to clear them. But the house was up and open to the public from November 30th to December15th, 2013. 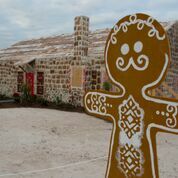 Made of frosted gingerbread bricks set on a wooden structure, lollipops and candy canes decorated the outside along with ‘frosted’ windows. It had a volume of over 39,000 sq. ft., was 60 ft. long, 42 ft. wide, and over 10 ft. tall at its apex. 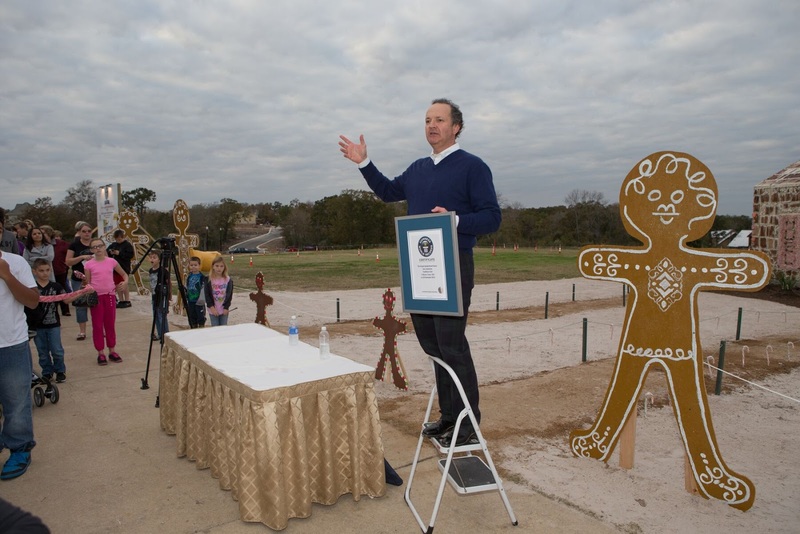 And, yes, a rep from Guinness Records flew in, did his sums, and declared it the world’s largest gingerbread house—beating the previous record. Habitat for Humanities later disassembled the gingerbread house and were able to use the lumber and materials for 3 new family homes. The Traditions Club had raised $208,000 for the St. Joseph’s Trauma Unit. And no single person consumed the 35,823,400 calories . . . .
My thanks to Bill Horton for supplying the information in this post, and to Ashley Hinojosa for sending me the photos. Photos all courtesy of Michael Kellett Photography. This is a letter from my collection. I have no information on the author or the folks he references, no last names, location, nothing. I don't know who Mary and Charlie were, but I hope they never spent another Christmas apart. I have left the letter as-is verbatim, though I did clean up some spelling. I am struck by Charlie's vivid imagery. But back then, letter writing was an art. He seems to just let his heart and his mind wander dreamily. At least that's my impression. What's yours? Merry Christmas, y'all! You asked me to tell you how we spent Christmas on the ranch. I venture to guess, it was a far cry from how you spent yours in New York City. I can just see you in the December twilight, hurrying down the snowy sidewalk, your silk hem leaving swirly prints in the powder like little snakes, your dainty black books becoming wet and shiny as you bustle about. Then you dashed up the stairs to your brother’s brownstone to enjoy hot chocolate, the embraces of your family, and a true smorgasbord of food. I bet you had ham and goose, maybe even pheasant. Fresh fruits and vegetables. And desserts. Not just pies, either, but cookies and candy, because sugar is plentiful in the city. You decorated your tree with delicate glass ornaments, glistening tin cut-outs, perhaps white porcelain stars? You hung presents on the tree as well--store-bought presents. I can imagine the pearl necklace from your parents only pales in comparison to your beauty. On the ranch, things were different as different can be. I rode fence Christmas Eve. 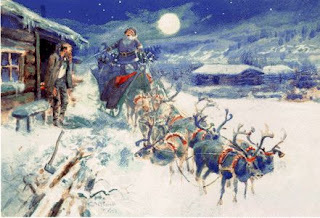 The wind howled and the snow fell in blustery, biting swirls. The air was so frigid it liked to have froze me to death. If not for the fence, I most likely would have lost my way more than once. Upon my return, I can say I was never so glad to see the warm glow of the bunkhouse windows. Us fellas gathered Christmas Eve night in Mr. Chester’s parlor. Mrs. Chester and the two little girls did a fine job of decorating the tree with popcorn, red ribbons, cookie dough ornaments, and some holly berries. The family then presented all us hands with new neckerchiefs, wool socks knitted by Mrs. Chester’s sweet hands, and our own plate of butter cookies. Much to my surprise and delight, Mr. Chester promoted me to foreman as Jack has given his notice and will be leaving in a few weeks. To celebrate the occasion, Mr. Chester presented me with a new lariat. I am very gratified by this change in my status, Mary, for reasons you may deduce. The boys and I went back to the bunkhouse and exchanged a few gifts. Pete. S. gave me a fine buck knife from his collection, and I gave him a pair of my spurs. I am ashamed to say I had lamented the gift a little until I was told of the promotion. The jump in pay will much ease the loss of the spurs. I suppose, though, a gift that is easy to give is not much of a gift. I have several small gifts waiting here for you when you return, and one of greater import. We shall have Christmas in January, you and I, and celebrate not only the season that has passed but a bright and sparkling future. Especially so now. If you see things the way I see them, that is. I cannot tell you how empty Christmas was without you, Mary, and I hope never to be parted from you again. That is bold of me to say. You know my heart, though, the words I long to say, the dreams I hope to share with you. I can only say in this letter that I hope you will hurry home.